Canon Triest named his congregation ‘Hospital Brothers of Saint Vincent’, and he made this French saint their patron saint. 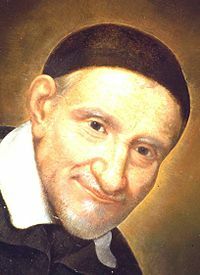 Even today, Vincent de Paul is still more than a source of inspiration for the Brothers of Charity. Born in 1581 in Pouy, France, this farmer’s son was able to get an education thanks to the support of a lawyer. At the age of 19, he was ordained a priest. Vincent spent his first few years searching for financial resources to support his family. Following a rather adventurous 10-year period, he started to see the error of his ways, and it became clear to him that, as a priest, he had a mission to fulfil. People such as Pierre de Bérulle, Francis de Sales, and the Gondi family put him on a new path: the path of caring for the poor, both spiritually and materially. In 1617, a special experience and a confrontation in a small parish in Châtillon convinced him of the great needs that existed in France. He set up popular missions in the parishes belonging to the Gondi family, which resulted in the establishment of the Congregation of the Mission, later called Lazarists. They would organize these popular missions and see to the formation of seminarians. To alleviate the many material needs, Vincent created the ‘Confraternities of Charity’ with the help of noble ladies, which would quickly spread all over France and give rise to a true sense of solidarity with the poor. From 1632, the Priory of Saint Lazare in Paris became the headquarters for the many activities Vincent developed. As a result, it was one of the largest spiritual centres in France at the time, with formation and training for missionaries, a seminary, retreats for priests, a leprosarium, and an asylum for the mentally ill.
Vincent died on 27 September 1660. 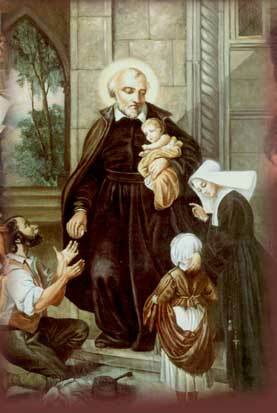 He was canonized in 1737 and declared the patron saint of Christian charity.